Row 1 – Lucretia Winn Major (Joe) of Edgefield, Elizabeth Bryan Hollar (Forrest) of Martinez, Ga.,, Julian (Butch) Pendarvis (Beth) of Edisto Beach, Joanne Watson Painter (Jimmy) of Edgefield, Helen Timmerman Daeger (Richard) of Blythewood, Hazel Mathis Kitchens (Everette) of Edgefield, Betty Wise Jackson (Clyde) of Trenton. Row 2 – Janice Padgett Whatley (Payne) of Edgefield, Frances Williamson Talbert (Pete) of Edgefield, Floyd Seawright (Wanda) of Edgefield, Clyde Jackson (Betty) of Trenton, Judith Van Buren Warner of Aiken, Barbara Griffin Ussery (Jimmy) of Jackson. Row 3 – Clifford Odom (Sammi) of Saluda, Jimmy Painter (Joanne) of Edgefield, Duffie Winn (Rose) of Orangeburg, Barbara Rucker Stark of Edgefield, Horace Sawyer (Vivian) of Gainesville, FL, Betsy Corley Stribling (Tom) of North Augusta, Tim Marbert (Virginia) of Summerville, Robert Stark of Edgefield, Mary T. Tompkins Freeman (Ted) of Lugoff. This class originally had 48 members. As of the reunion, there are nine deceased: Jimmy Ouzts, Frances Byrd Smith, Albert Eubanks, Darwin Cook, Raymond Quarles, Stokes Rucker, Sidney Wright, Syble Ouzts Cromer and Virginia Percival. 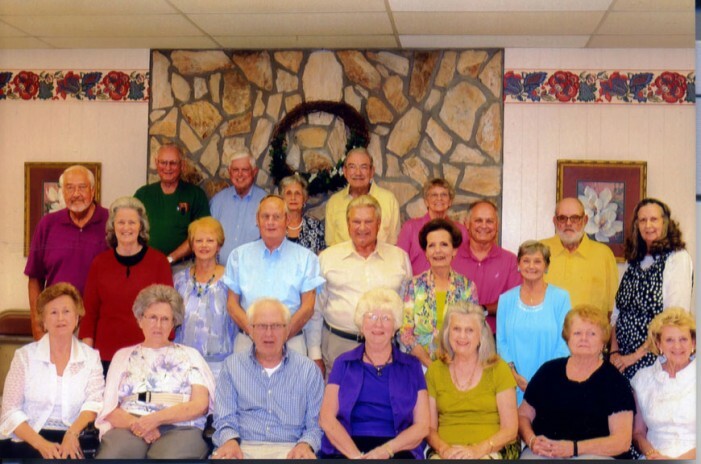 There were 22 of the remaining 39 attending the reunion. Everyone enjoyed visiting and reliving some old times and telling about new ones. There was a candlelight tribute to those deceased. Many delightful and interesting comments were made about each one. It was mutually decided that we probably won’t wait five years for the next reunion. It will most likely be in two years.